There is such a poetic quality of that opening statement in the prologue that is really lost on the reader until a little later in that chapter. Such a strong analogy. The path of pins represents taking the easy way out by just pinning up your problems and letting them hold until they can’t anymore and need to be fixed again. Whereas, taking the path of needles sounds more exhausting. Come on, who has the time to sew up a torn mess every time a problem comes along? But it’s the choice to fix something more permanently, regardless of the pain or effort. And that is what Rachelle’s story in Crimson Bound is all about. There are things I loved about this book and things that I appreciated. I will differentiate these things for you. She was such a complex character. She was struggling throughout the story with herself, looking for redemption for what she will ultimately become: an unnatural, wicked creature of the dark Great Forest known as a forestborn. There were seeds of darkness and black desire in her, no matter how hard she resisted the pull of the Forest and the evil being that reigned in it. She wanted to save the world no matter the risk to herself, taking the path of needles, and that’s what led her to such a detrimental consequence. BUT even with the occasional pleasure of darkness, she never gave in. Never gave up her heart without a fight. She saved human lives with whatever leftover time she had before she completely turned into a heartless, soulless forestborn. You see? Rachelle is quite possibly one of THE strongest protagonists I have yet to read about. 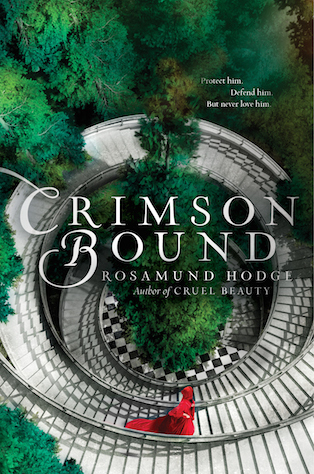 Crimson Bound wasn’t even written in 1st person, but there is such a clear indication through Hodge’s writing of how conflicted she was yet made strong by it. She quite possibly judged herself the most harshly out of all the humans who knew her, but that also made her push herself harder than anyone else would. And thus, she really did take the path of needles. “She’d never said the rosary that was to be her penance…Besides, penance was for those who had a hope of heaven, and she wasn’t at all sure that God could hear or find her in this place. But that was all right, wasn’t it? She had known she was risking her soul, but she had gone ahead anyway…She might’ve repented, but she couldn’t quite regret. Even when things went horribly wrong, and plot twists flew from areas even I didn’t imagine until too late, she put herself last, all else be damned. Or rather, she thought she was damned for all eternity for what she was now, so this was her way of being courageous. There’s just so much to say about Rachelle that I could go on but it’s best that I don’t or else this would get so long. She wasn’t some simple, fit-into-some-mould of a YA protagonist. She was fierce and strong, yet vulnerable too when it came to the human side of her that she desperately clung to. And that shone through the best when dealing with the people she loved. First, I have to mention, it’s awesome that Hodge made our love interest a guy with no hands. Don’t ask why. You’ll have to figure that out for yourself in the book. But that’s also pretty original and talented on her part for making us root for a guy who honestly? I would not know how I’d feel about someone with silver hands that burn up in the hot sun. But he brought out the side of Rachelle that reminded her that she could still choose to love, even with the dark temptations inside drawing her deeper into the Forest and away from human memories. That is possibly the only reason why I loved this romance. Here’s where I appreciated Armand, the love interest. He was a pretty confusing person too, with secrets of his own. I liked him, and especially what he was able to do for Rachelle through this love forming between them, but I just didn’t FEEL the hot chemistry between them that I was hoping for. Ah well. As for the friend, Amelie was amazing for a secondary character. I loved how she also in another way did the same for Rachelle as Armand did. She was an anchor and testament of a human who could love a wicked creature even when no one else trusted Rachelle, not even herself. I can’t really call him that. Maybe call him the potential love triangle that could be. Although Rachelle never loved him, hate and love are pretty strong opposite end of the spectrum feelings. No matter what it was she felt for this guy, it was strong. And normally, as a reader, I can hate the other guy pretty strongly no matter what the protagonist feels. Oddly enough, not this time. And that speaks volumes. Hodge made him into such a complex character as well. He wasn’t good, that’s for sure, yet I can’t quite bring myself to despise him. He was charming, but snakes can be charming and deadly and pure awful. He wasn’t charming in THAT sense. I think he loved Rachelle in the limited way that he could with the bad decisions he made, and honestly thought he was doing the best for them both in a twisted way. He did unspeakable horrors and wasn’t repentant. That alone should deter me away from him. But no, at the end, I felt what Rachelle felt for him. Love, hate, and sorrow for what could’ve been. And this is what separates good writing with brilliant ones. I just wanted to conclude off this long review with my clarification of what I loved and what I appreciated. I loved Hodge’s extremely complex and well-rounded characters. They weren’t just flat, one-dimensional people who were just good or just bad. It’s not black and white like that, just as it is in reality. I also loved her writing and its storytelling manner. Just look at this excerpt from the beginning. “This story begins with endless night and infinite forest; with two orphaned children, and two swords made of broken bone. But what I only appreciated and thus lowered my rating was – well – the sheer darkness of it. Don’t get me wrong. I didn’t dislike it or anything. It made the book gritty and full of character. I just don’t happen to love my stories extremely dark, that’s all. And it was fierce and vicious sometimes, what those characters did to each other, even in the name of sacrifice and love. Unfortunately, my little fluffy heart can’t take all that much of it in such large doses, but I CAN appreciate how well done it was and how it cemented everything together. All in all, Crimson Bound was an epic tale of good versus evil, with a heroine that isn’t just purely good. She walked a fine line in the gray zone, but it showed that decisions and the choices we make can ultimately decide our fate and which side of that line we may fall on. There’s a whole lot that can be said about Crimson Bound. It’s beyond a simple tale of good versus evil. 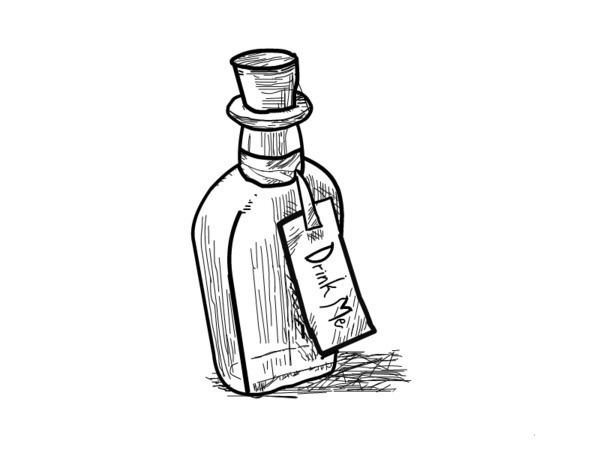 Hodge regales us with characters that are more complex than the average fantasy hero. They may not be strictly good, but the choices made in life can determine whether they can be redeemed. So this story is basically one of redemption and conflict against the darkness, with a brilliantly written protagonist at the centre of it, fighting to maintain her human heart and the ability to love like they do. I would recommend that this be given a shot as Hodge has crafted a very dark and deliciously scary world, but this may not be the best book for those of the light-hearted. I have given you fair warning. Now go and check it out!